This article, written by Jason Hippisley, first appeared in the Market Rasen Mail (November 15th & 21st 2006), and has been reproduced here with the kind permission of the editor Jason Hippisley and photographers Jason Hippisley & Dianne Tuckett. When a perfectly ordinary looking woman strolls into a newspaper office and declares herself to be a hermit surely you can be excused a certain incredulity. There are no hair-shirts and excessively long finger nails. Instead there is someone broadly smiling, clean and well kempt and excessively personable. More's the point she is standing in front of you and speaking. Hermits just don't do that. But Rachel Denton does. Rachel is, if you like, a 21st century hermit, living in Wolds-edge village with a car, a telephone, electricity, and a liking of people. But she is faithful to the traditions of hermits in that she has sought to lead a solitary and simple life of contemplative silence - just not in perfect isolation on the side of a mountain. 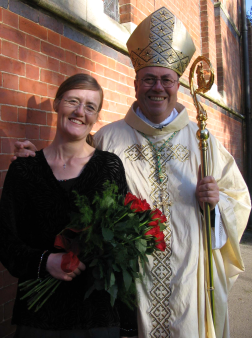 She has been a hermit for the past five years, but her vocation takes on a certain professional aspect on Saturday (Nov 18) when she takes her vows at Market Rasen's Holy Rood Catholic Church to sign her life over to God as the very first Hermit of the Diocese of Nottingham. She will receive a wedding ring and be committed to a life of celibacy, poverty, chastity and obedience in the service of God. "Saturday is about commitment, about me saying this is right for me; it's what God has called me to for the rest of my life. And about the church acknowledging that and accepting me as a hermit. It's like getting a badge to say I'm a hermit." There have always been hermits since the seventh century or so and in the last 50 years people have begun to look at it again, increasingly so in the last two decades. "It's not like it's become normal, but the church has said it's OK, that they recognise hermits." Effectively hermitage is little different to being a monk or a nun, but without the community. Immediately after university – at Newcastle where she became inspired by St Cuthbert - Rachel was a novice in a Carmelite monastery, but after a year felt that it wasn't for her. "There was too much community and not enough hermitage and so I left." 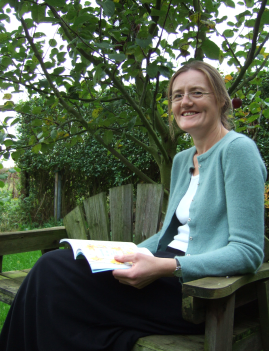 She became a science teacher, graduating to deputy head in Cambridgeshire, but always felt a calling within her and after 15 years in the classroom found herself setting up her hermitage in Lincolnshire in 2001. Ordinarily hermits adopt the solitude of hermitage after experiencing community life with the Benedictines, Dominicans, Carmelites or their like. "For someone to do it from a standing start is very unusual." So unusual in fact that she actually had to show Bishop Malcolm McMahon, head of the catholic diocese who will do the honours on Saturday, where there were measures within canon law to allow it. "Life has been fairly normal with boyfriends and all that but I always knew that I wanted something different. The problem is you can't just walk into a hermitage." Eight years ago she met Father Matthew and told him of her pipe dream to become a hermit, 'which is just w hat it was, a pipe dream'. He took me seriously and helped me with direction and a programme of study and preparation." 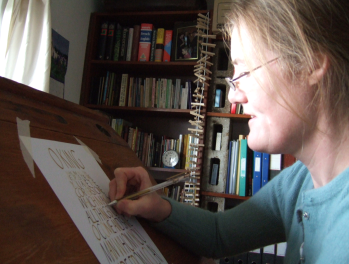 Despite being almost self sufficient in fruit and vegetables, even hermits have bills to pay and to that end Rachel (43) has developed a fascination with calligraphy into a bespoke cards and stationary business operated through www.stcuthbertshouse.co.uk which she thinks sits well with her eremitical existence. Calligraphy in its way is a form of prayer, she says, observing that “rather perversely for a hermit I love words. We live in a world that sells them cheaply and so they can become cynical and meaningless. Calligraphy is a means of slowing all that down; exploring and valuing the particular form and value of each word, each phrase. Calligraphy is a product that can speak eloquently from the silence of the hermitage." "My role is prayer. I am here to pray for the church and the world and without that my life in hermitage would be meaningless, it would just be a lonely existence. "Hermitage is a state of being and my life is a life of prayer, I do not have to be permanently in solitude and silence to achieve that but without prayer this life would not make sense. "You cannot live is perfect isolation; it would be unhealthy to do so and develop an arrogance. You can't be a hermit without the community, without the dustmen and the water engineers just as hermits in history couldn't have done it without benefactors giving them food. It's about solitude, not isolation." "I stay here in this space and of course I have to leave it occasionally, but not unnecessarily so. I only see my parents twice a year and friends once a year. There are probably fewer than a dozen social occasions a year but I am always glad to get back here, back to living a very simple life – being quiet and listening; listening not only to birds and nature but to myself and to God. "I come back to solitude and silence in the same way most people come back to a family." Rachel is a straight talking, personable and open sort of woman, typical of her Catholic roots in Stockport – going to St Winifred's School, later made famous with the song Grandma – Manchester and Leeds and while her family supports her destiny, they do not fully understand it.. Her aunt is a Poor Clare nun in Arundel – who featured on the TV show Convent - and so she always knew about nuns, wanting to be one as a child because she wanted a long dress! Rachel is the first to admit that 'living as a hermit these days is a strange and outlandish thing'. "But in reality the experience of it is surprisingly ordinary," she says. And it is exactly that, with just the solitary chair in the living room hinting at something other than ordinary. 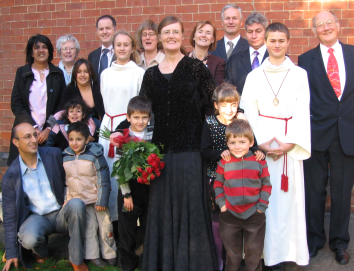 GUESTS travelled from Dehli and the farthest reaches of England to be there when Rachel Denton made church history by becoming the first Hermit of the Diocese of Nottingham. As revealed in last week's Mail, Rachel has determined to devote her life to the solemnity, solitude and silence of hermitage. On Saturday she made her solemn profession as a hermit in front of family, friends and parishioners at Market Rasen's Holy Rood Catholic Church. During Mass she declared her intentions 'to live for God alone, in persevering prayer and willing penance, in humble work and holiness of life,' to Catholi c Bishop Malcolm McMahon. Dramatically she prostrated herself before the altar during prayers to saints associated with her life, and then accepted a ring in a symbolic marriage to Christ and a crucifix to wear throughout her life. "With my whole heart I give myself to this way of life, in simplicity, solitude and silence," she said. The former secondary school science teacher and deputy head, aged 43, has established a calligraphy business in order to gain a meagre income to meet living expenses. She had been working up to the profession of her hermitage for five years since moving to the area. "I was thrilled that so many family, friends and people from the parish considered hermitage important enough to travel long distances to come and celebrate with me," she said.